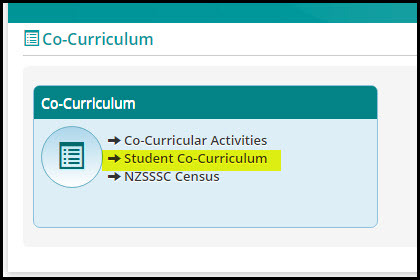 2018 NZSSSC secondary schools sports census enables the NZ Secondary Schools Sports Council to capture a wide range of data that is an important tool in school sports advocacy, identifying trends, informing change and providing information at an individual school, regional and national levels. 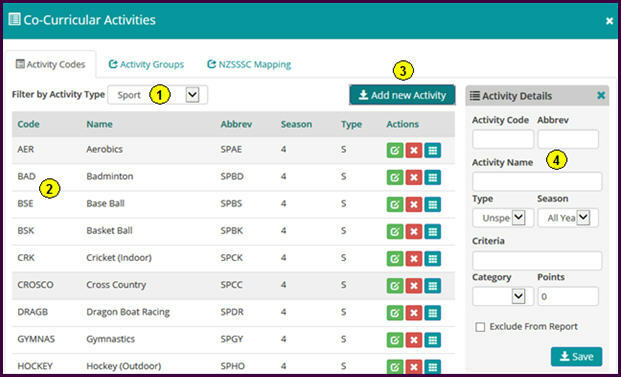 ***IMPORTANT*** If you are using the PCSchool NZSSSC tool there are some required changes to certain sports names for 2018. 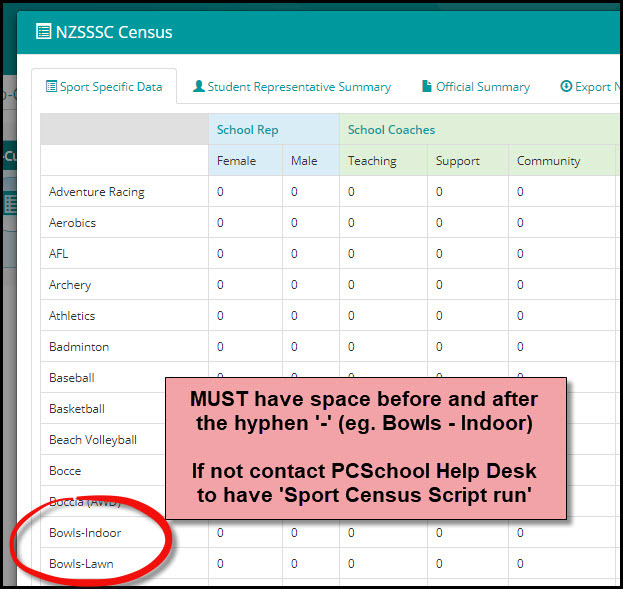 Please contact the PCSchool Help Desk (help@pcschool.net) and ask for the NZ Sports Census script to be run on your Spider prior to generating your sports export. To watch a video tutorial regarding this, click here. You only need to use one method. The Officials Category must have Sport Official selected and not Team Officials. If these have already been created please contact PCSchool to have these transferred. 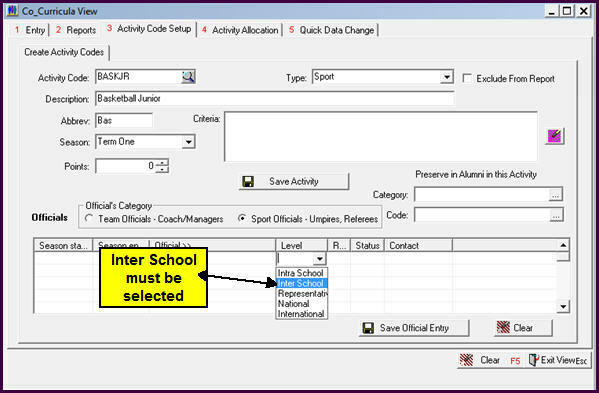 All Officials must have the Level of Inter School Selected other fields can be selected as necessary. 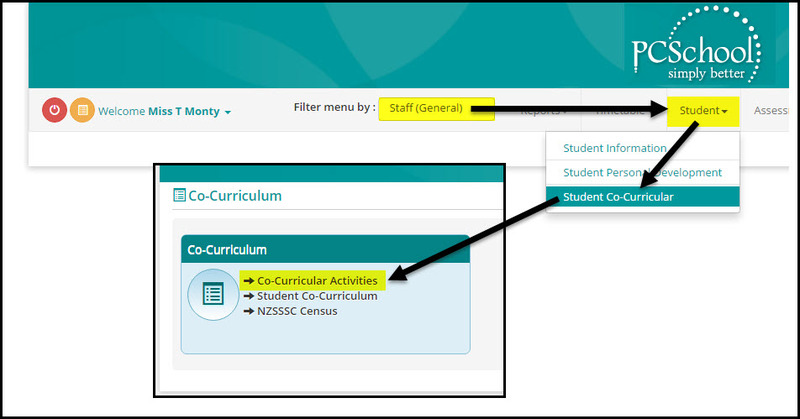 In Co-Curricula Manager select Co-Curricular Activities. In the Activity Codes tab click the [Add new Activity] button. If you can’t see the add widow on the side it will be available below the list of sports. Select the Activity Type of Sport. List of the currently available Sports. Enter the details of the new Activity. In the Activity Codes tab you can Add, Edit or Remove Activities. Green Button – click to bring up the Activity Details window to Edit the Sport. Red Button – click to Delete the Sport line. Blue Button – click to view the Groups or Officials. Click Save and continue adding Officials to this Group. 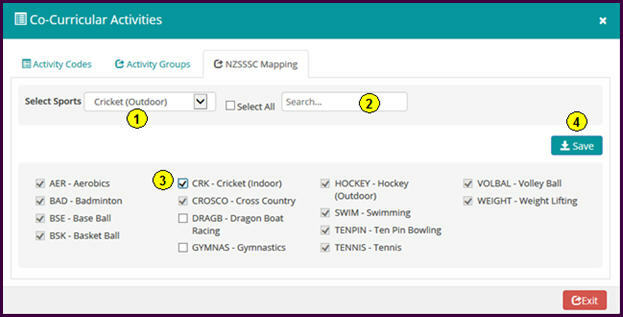 Activity Groups tab – In Activity Groups you can Add Edit of Delete Activities, to Edit the description of a current Activity click the Green Edit Icon. Go to the Activity Groups tab. To enter a new activity type in the Code to be used. 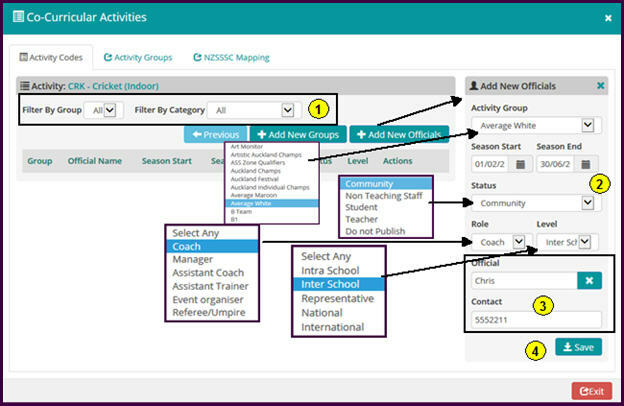 Enter the description or you can change the description of a selected Activity Group. 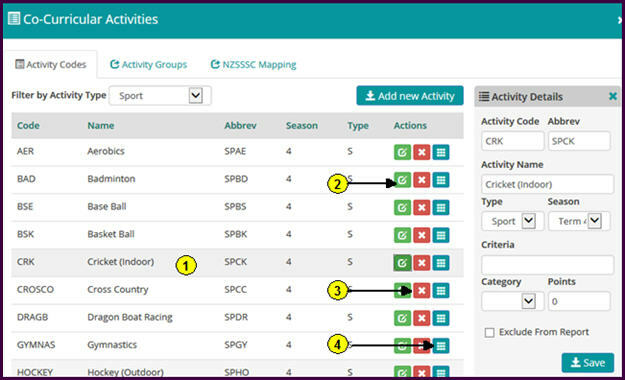 NZSSSC Mapping tab – You must Map the Activity to a NZSSSC listed Sport; multiple available Activities can be added to one Selected Sport. The Selected Sports is the official list and are the only options available for selection. Enter part of the known name of a sport to reduce the list of available sports for mapping. Tick the sport to attach, the greyed out sports are already mapped. Once you click Save you will receive the following message. You can View the details to be uploaded to the Sports Census, this is based on the information entered. NOTE: Changes specific for 2018 include some minor changes in the names of certain sports. Please ensure these changes are visible as per the screenshot below. If the two Bowls sports do not have spaces before and after the hyphen, you will need to contact PCSchool to have the ‘Sports Census Script’ run on your Spider. Official Summary will only show Staff members. Go to the Export NZSSSC Census tab and fill in your details then click the [Generate NZSSSC Census Report] button to upload the file. 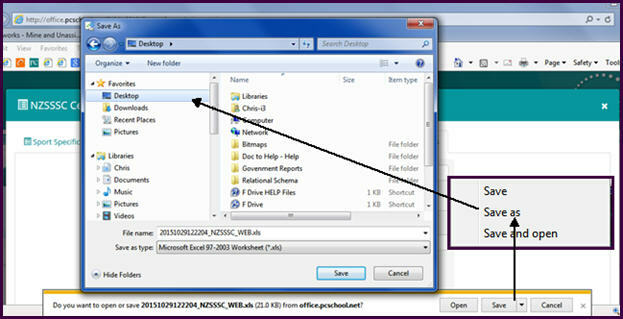 In the Windows options if you just click Save the document will probably be saved in your download file. If you click Save As you will be able to select the destination.